Can I use a supplier that’s not on your supplier list? Absolutely! We may already work with that supplier and if not we are always happy to establish relationships with new partners. Please have the classroom teachers enter the descriptions, product code, quantities and estimated prices of the goods they need onto an excel spreadsheet (we have an order form template for your convenience). Please attach these spreadsheets to an email and send them to your dedicated Client Care Specialist. If I have a problem with a product, who do I contact? Your dedicated Client Care Specialist at EquipMySchool will be pleased to quickly and efficiently resolve any problems that you may have. Please do not contact the supplier directly as they will not have a good record of your order and are unlikely to be able to help. No. Instead, we use volumes of scale to leverage trade discount from the suppliers you choose. You pay the International Catalogue price and we use the discounts negotiated to cover our costs. Customs is notoriously difficult in my country. Can EquipMySchool help ensure our shipment is delivered on time? Yes. We have worked closely with freight agents, Customs agencies, and clients worldwide to develop our process for import and Customs clearance. Your shipment is sent with a document designed specifically for Customs clearance, showing only the information required by each of the countries and ports your shipment will travel through. Often each country, and sometimes individual ports within that same country, will have unique rules and regulations for imports. If Customs clearance can be tricky in your country, our years of experience with Customs will help ensure your package will be delivered safely and on time. We have, and continue to, supply clients worldwide, including establishments in Angola, Vietnam, Nigeria, Uganda, Egypt, Qatar, Kuwait, Oman, Morocco, South Korea, Brunei, Romania, Peru, Brazil, Venezuela, Zambia, Ethiopia, Malaysia, Switzerland, Thailand, The Philippines, Tanzania, Germany, Japan, Singapore, Indonesia, The Netherlands, China, Cambodia, Niger, Burkina Faso, Myanmar, Italy, Tunisia and Liberia. EquipMySchool.com provides a system of checks and balances to ensure mistakes are unlikely to remain unnoticed. Once you submit the order, it is checked first by an automated system, and then by hand. Then we return the corrected order to you for final approval. This eliminates 99% of mistakes made during the ordering process. If anything does manage to slip through the net, we will work with you to rectify the problem as quickly, painlessly and cost effectively as possible. British Pounds can be sent to our Sterling account held in the United Kingdom. US Dollar payments can be made to our American held bank account. Please let us know if you are interested in paying in Euros. Will I have a dedicated contact at EquipMySchool? Yes. One of our Client Care Specialists, who can all be seen on the Meet our Team page, will be given the responsibility of looking after you and your orders. Day to day, that person will be able to assist you with anything you need from EquipMySchool. Typically our clients should budget between 3 and 4 months between first enquiry and delivery to school. We would be pleased to discuss the timing of your specific order. The most important date is the date by which you need the goods in school. We can calculate the rest from there. If you have not already done so, please register for access to EquipMySchool.com. Once your registration has been accepted it will be linked to your purchasing account and you will be able to review your order history all the way back to when your school first used our service. The short answer is “the client school”. The question “When do I pay the duties and taxes?” requires slightly longer to explain. Because then we get into the very complicated world of Incoterms. 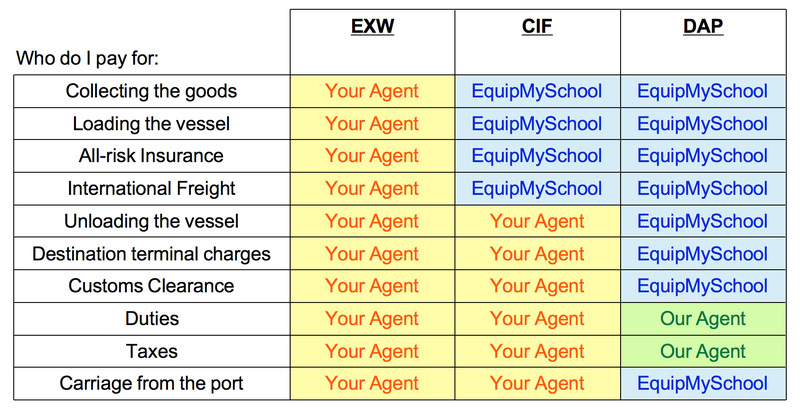 EquipMySchool can work with any Incoterms but the four most commonly used are discussed below. Ex Works (EXW) – The pro forma invoice will include no export freight charges. EquipMySchool prepares the goods for collection and our client organises and pays a 3rd party for all transport, insurance, handling, duties and taxes to have the goods moved to their chosen destination. Carriage, Insurance and Freight (CIF) – The pro forma invoice will include the cost of freighting the goods to a sea port local to the client. Insurance to that point is also included. The client will organise and pay a 3rd party to clear the goods through customs, insure the goods while in their country as well as settle the bill for duties and taxes. Delivered at Place (DAP) – The pro forma invoice will include the cost of moving the goods all the way to our client’s delivery address, including the handling charges for clearing customs. This quotation will not include any duties or taxes, which will need to be paid to our clearing agent, directly by the client, before delivery can take place. Delivered, Duty Paid (DDP) – In this most comprehensive scenario all freight and associated costs are included in the pro forma invoice from EquipMySchool. The client pays EquipMySchool for the international freight, insurance, customs clearance, handling, duties and taxes. It may still be necessary to communicate with the delivery agent however there should be no bill to settle with them directly. It is worth noting the quotation will be based on the facts available at that time. While EquipMySchool will do its utmost to honour the quotation, unforeseen circumstances when the goods arrive at destination could result in additional charges. If these are outside of the control of EquipMySchool we would require these to be settled by the client before delivery. I hope you can see that under each of the four available services all of the exact same charges must be paid by the client school. Selecting a service will ensure that everyone knows who is responsible to pay for what and at what stage in the process. EquipMySchool is equally happy to provide any of the above services. 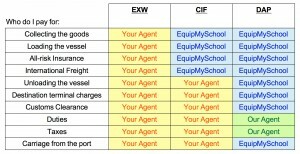 However, if the client school has a strong working relationship with a clearing agent local to them we recommend EquipMySchool provides a CIF service and the client pays that agent directly for the remaining services. This will keep costs to a minimum. Do you have an order form I can use? Yes! You can download the EquipMySchool order form below. There are versions in United States Dollars or British Pounds Sterling. It is not essential that you use either of these forms. If you already have a document that you use for internal purposes then please submit your orders in that format. Do you work with my favourite supplier(s)? EquipMySchool can cost effectively access any resources available for sale in United Kingdom, United States, Canada, Europe and even Australia. Check our suppliers section of this site to see some of the main brands and companies that we work with every day. What kind of discounts do I receive with EquipMySchool.com? Books from Scholastic, Collins, Penguin, Schofield and Sims, Dorling Kindersley, Houghton Mifflin Harcourt and a number of other large publishers of educational books are sold at 20% discount from the RRP. All other textbooks are charged at 7.5% discount from the international catalogue price. Non-books (i.e. classroom resources) and books where insufficient discount is available are charged at the international catalogue price. Items from charitable organisations, Internet based companies and suppliers who charge shipping and/or handling are charged at the international catalogue price plus an appropriate service charge. The charge will be kept to an absolute minimum and will never be more than 10% of the cost of the goods. Get started with EquipMySchool today. I am writing a short note to say that we were very pleased with the consolidation and delivery of the Davy College order. Congratulations on doing a great job, and also in very good time! Wow wow wow ! Just to let you know that we received today the package containing the 4 receipt books and they went through customs without any problem ! That was super fast and amazing, EMS ! Thanks so much indeed for all you do, you are all number one 🙂 ! Thank you for your great, professional service and on-going assistance. Working with you was a delight and we look forward to a new collaboration next year. It is always a pleasure working with you - Equip My School is organised and efficient and makes my life easier !! Thank you for sending the books out to us. I received them yesterday and my staff are very happy. Once again, I am grateful for the efficiency of your team. I too, would like to add my vote of thanks to the EquipMySchool staff for the very professional and prompt manner in which our order for the next school year is being handled. It is good to work with such a fine group of business-minded persons. Happy New Year. First let me begin by thanking you and your team at Equip My School for making our 2014 orders easy to manage. Good to hear from you again and glad to hear business is good for you too. It doesn’t surprise me, as the service you provide is so good I can’t imagine why anyone would go anywhere else! Equip my school has been a revelation for BNA - things are running so much better here now with our orders etc. We actually have equipment! Many thanks for your help during the past year. Irene and I both enjoy working with you and your efficiency makes us look good! !